BELLVILLE — The contributions of Jim Gorman to the Bellville community were honored Tuesday at ceremonies at village hall. 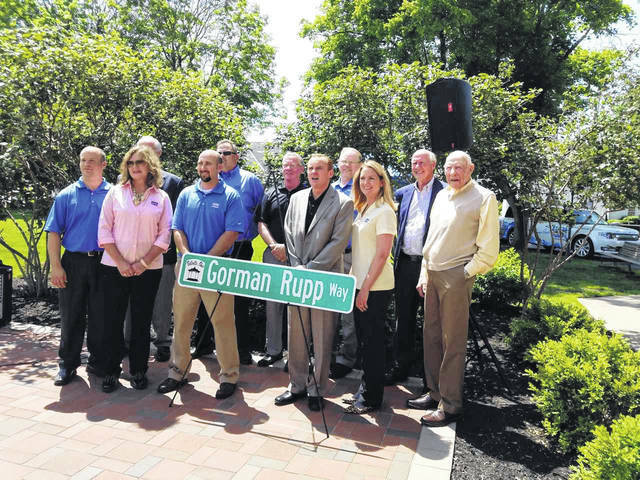 Village and county officials, employees of Gorman Rupp and residents gathered to mark Tuesday, June 26, as James Gorman Day. A street in the I-71, State Route 97 west corridor has been named Jim Gorman Way. And a fountain in front of village hall was donated by Gorman. Gorman Rupp Way is the street which runs between the Speedway station off State Route 97 and McDonald’s. Gorman has donated land in the area, part of which is being used as a catch basin along the route. 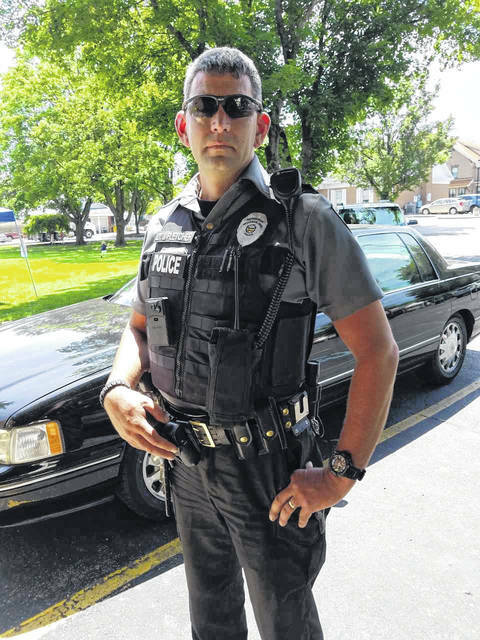 Village officials also noted that Gorman donated money to buy new police vests. Lt. Jon Fletcher attended the dedication, showing off a new vest. Gorman told people how he had acquired land along State Route 97. He said he was in New Guinea and his father told him he had “bought you a farm.” Gorman said he thought that was the last thing he needed, a farm. He said his father didn’t “give it to me.” He made him pay for it. This was 10 acres near I-71. Mayor Teri Brenkus said she had visited Gorman Rupp, and saw photos there which are of 517 employees. She said Gorman Rupp, the “pump people,” have the reputation of providing services to people around the world. Brenkus, in reading a proclamation, said Gorman Rupp supplies pumps to people in 140 countries. Rupp was an Air Force pilot and has been associated with the 179th Airlift Wing at Lahm Air Base in Mansfield. Brenkus said plans are to circle the new fountain in front of village hall with fencing and make the courtyard user friendly with bistro sets. Richland County Commissioners Marilyn John, Tony Vero and Darrell Banks, the village’s former mayor, also attended the dedication. Banks said Gorman Rupp has contributed to the community for 60 years. It has given people jobs, helped people pay mortgages and put kids through college, said Banks. Rupp’s daughter, Gail, donated the land now being used as the site for a new Avita health care facility. That building, right at I-71 and State Route 97, will house three doctors. Banks said it is a long time since this area has had access to that kind of health care. The Gorman Rupp plant has grown from 9,600 square feet to 98,000 square feet, he said.